In my first quarter article, I highlighted work occurring in Dubuque, Iowa to foster cross-sector collaboration for social sustainability through the development of a community equity profile, strategies and action plans. In subsequent columns, I addressed the role of local government in contributing toward these efforts and more specifically on local efforts that align with recommendations from the president’s Task Force on 21st Century Policing. In this column, I will focus on leveraging volunteers in supporting equity advances. 1) Ensuring all youth read at grade level by third grade. 2) Ensuring all youth graduate from high school. 3) Ensuring all youth complete post-secondary education or training. Staff’s role in the MBK initiative has been to facilitate connections between community-wide initiatives through the Community Foundation of Greater Dubuque and on-the-ground programs through nonprofit organizations. An additional focus has been on the ways in which community volunteers can be part of supporting the efforts of institutions. Teachers from neighborhood schools volunteering to tutor students participating in the Dubuque Dream Center’s Academic Support Center. A local barber offering free haircuts to children who read to him while getting their hair cut at a largely volunteer-run event called the Back to School Bash, whose efforts were supplemented this year by nonprofit partners providing youth with reading materials reflecting the diversity of our community. AmeriCorps Members serving in local schools to improve reading scores and attendance. College students and adults serving as tutors and mentors supporting summer learning with Campaign for Grade Level Reading partner St. Mark Youth Enrichment. Mentoring students of color at two local high schools through monthly sessions focused on building and defining respect, building a sense of unity and historical pride, and emphasizing the importance of education. 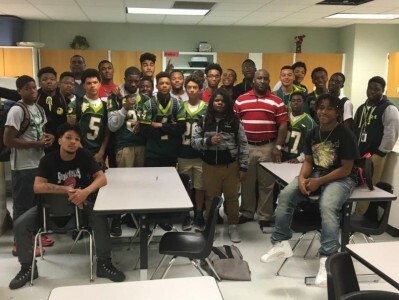 Delivering an annual program called the Manhood Project designed to provide education, motivation and skill-building for young men ages 12-18. Encouraging higher education by taking students to local colleges for campus tours that involve discussions with current students, information on financial aid, and selecting majors and extra-curricular activities. Supporting employment readiness through “Road to Success for Teens,” a program designed to provide youth 12-18 years old with foundational skills on navigating the employment cycle, including writing an effective resume, conducting a successful interview, wearing proper interview attire, developing leadership skills and business startup. Community volunteers who support Future Talk, a summer program for youth ages 13-18 that includes eight weeks of work for a stipend, along with community service projects. Certainly, there remains much work to be done and volunteers must be supported by institutions with the resources to sustain meaningful and effective programs. Nonetheless, Dubuque has begun to leverage the power of community to ensure that youth of all backgrounds have the opportunity to succeed.